Blog: Ethics training for lawyers – does the public trust you? With compliance, data protection and cyber attacks in the news, why on earth would ethics training for lawyers be at the top of your agenda? In recent times, we have experienced the rise of fake news and “post truth” election campaigns. 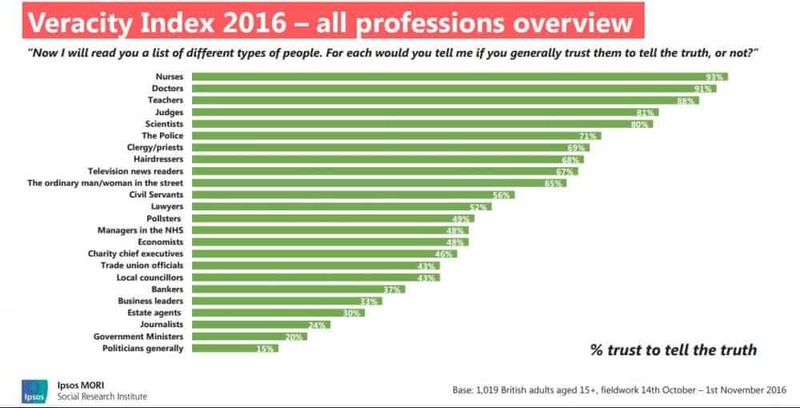 These, combined with unreliable polls and Michael Gove’s infamous attack on experts, have moved the credibility indexes substantially. So, what is the current state of affairs and how does the legal profession fare? The recently published Enough of Experts? Ipsos MORI Veracity Index 2016, sheds some light. It does not make happy reading for many professionals, including lawyers. So before looking at the efficacy of ethics training, let’s take a look at the league table. What the public thinks of you. Already I can hear you decrying the relevance of a survey compiled by pollsters! Indeed, the unreliability of polls and pollsters is directly reflected in the results. However, it is well worth looking down the table below… and I mean down. It is unsurprising to see the usual suspects at the top of the list and, indeed, at the bottom. Of the twenty-four groups listed, the legal profession comes twelfth, just above pollsters. Only 52% of those polled trust you! The perception of the great British public gives you a narrow margin of credibility. And, as we all know when it comes to purchasing decisions, perception is reality. 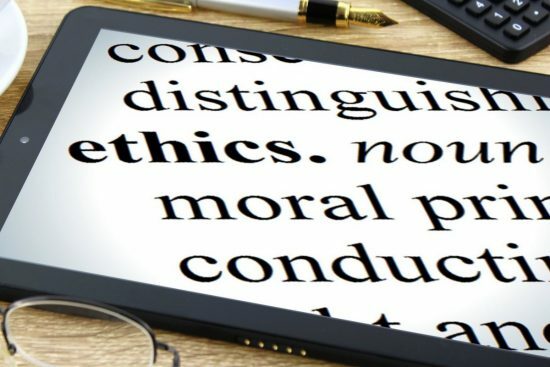 How does ethics training for lawyers fit in? As things stand at the moment, it hardly fits in at all. The need for solicitors to behave ethically in modern legal practice has never been stronger. The position of trust held by the legal profession cannot be taken for granted. It must be earned. Ethics training forms no part of undergraduate law courses. It is only open to those who elect to take the Legal Practice Course (LPC). There is also no requirement for qualified solicitors to undergo ethics training. It is possible that any solicitors who qualified before the introduction of the LPC will never have received ethics training. Even the proposed new Solicitors Qualifying Examination (SQE) appears not to fill the void. All of this comes as quite a surprise to other professionals. If you take a look at what they have to go through, there really is no comparison. The shining example is the Chartered Institute of Securities and Investment. At least 20% of its regulatory examinations comprise ethics components. In 2013, it also became the first UK professional body to require candidates to pass an integrity test. With the advent of the new EU General data Protections Rules and the new Draft SRA Accounts Rules, the more perspicacious legal clients will be aware of the level of due diligence and anti-money laundering checks that have to be performed upon them by solicitors. Surely there should be a balance when it comes to proof of probity and ethical training. This is the very reason ethical training is so important. Not only does it provide solicitors with the basic tools to do the job, it engenders client confidence. As qualified solicitors, you all have a duty to go through continuous professional development. Ethics training and ethics refresher training should be integral to that. There is a whole host of professional development training providers out there. Perhaps it’s time for your practice to take a look at those which can deliver ethics training for staff at all levels.